Athens gets a lot of credit for being the star of Greek history, but few people realize the role that Crete played in the country’s epic story. 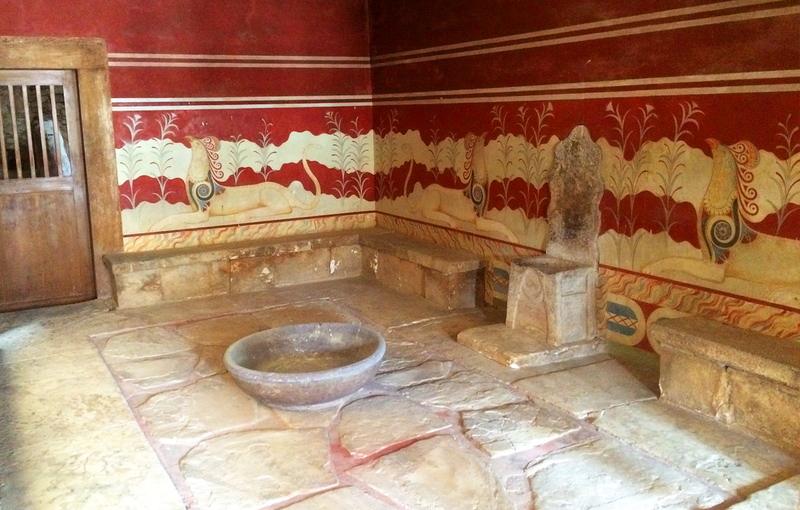 A hop, skip and a jump from the mainland Greece’s largest island was home to Knossos, which served as the political and social center of the Minoan civilization (2000-1350 BC). It’s believed to be the oldest city in Europe – dating as far back as the 7th century BC – and with a superlative like that, naturally we had to visit. The Palace of Knossos was actually a lot bigger than I thought it would be. 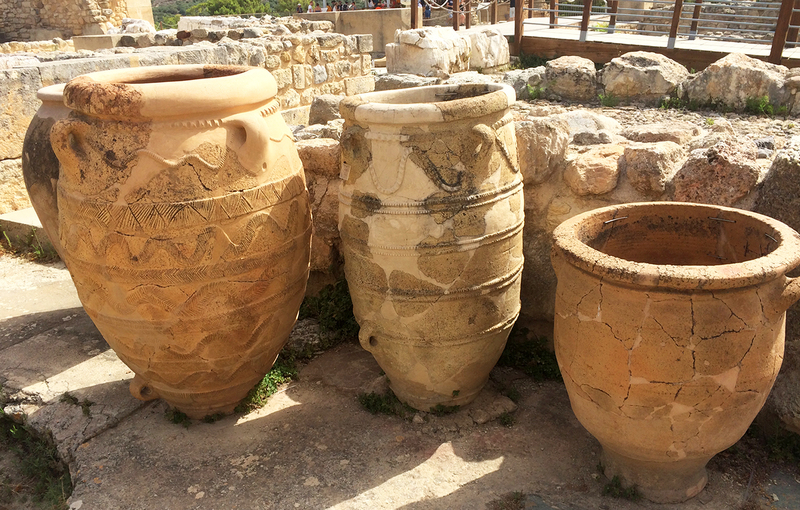 The complex covers nearly 4-square miles, making it the largest archaeological site in Crete. It’s convenient for visitors, only 15-20 minutes south of Heraklion by car with ample parking. As your driving, don’t be tempted to park at one of the paid lots along the way since the official parking lot is free (look for the blue and white “P” sign right before the main entrance, it will be clear). 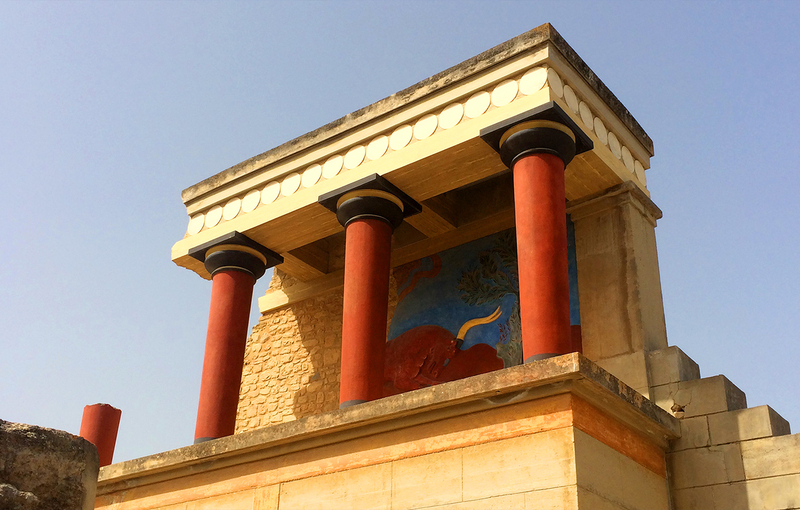 You can also reach Knossos by bus from Heraklion. 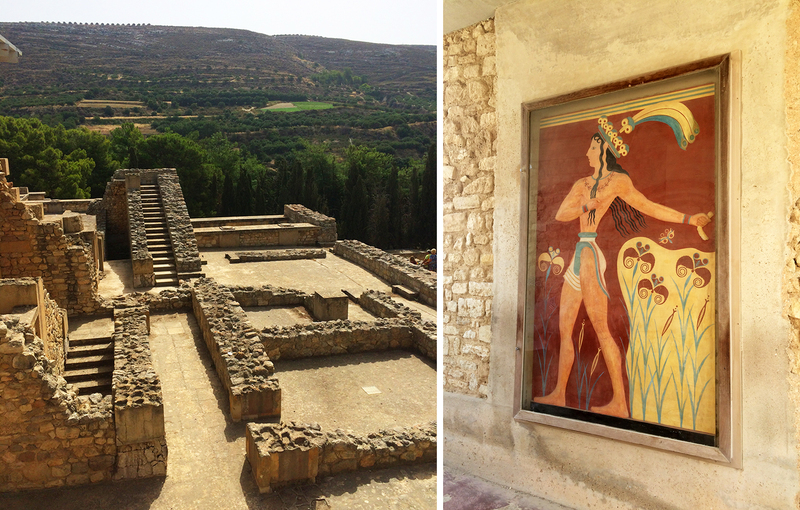 And even though Knossos is open every day, it’s a good idea to get there early to beat the crowds and mid-day heat. The day we visited was particularly hot (over 100 degrees Fahrenheit), and with little shade bringing your own water is a must. This sprawling complex is rooted in mythology, with a cast of characters including Minos, the first king of Crete, who hired Daedalus, skilled craftsman/architect and father of Icarus, to build a Labyrinth to hold the half-bull/half-man Minotaur. Legend also has it that Minos imprisoned the architect so that he could not reveal the labyrinth’s elaborate plan to anyone, which provoked Daedalus to construct two sets of wings for him and Icarus to escape, and we all know how that story ended. 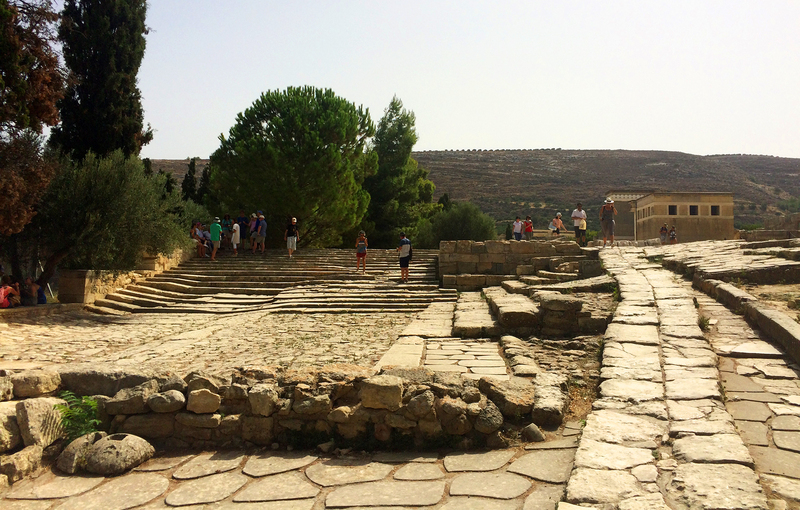 At one point Knossos boasted a population of 80,000 people, and what’s left of the complex today echoes its maze-like foundation. The once-grand site was discovered by British archaeologist Arthur Evans in the late 1800s with excavations beginning in 1900. It seems as if restoration work was hastily done, a best guess of what the complex looked like since little remained, with some sections altogether exaggerated and slapped together with concrete. Some people argue that the site is not even close to what it originally was, rather a complete fantasy based on 1920s art deco style, whereas others believe it is spot on. While we’ll never know for sure what the original Palace of Knossos looked like, I found it fun to wander through this multi-leveled playground of rooms, staircases and columns. 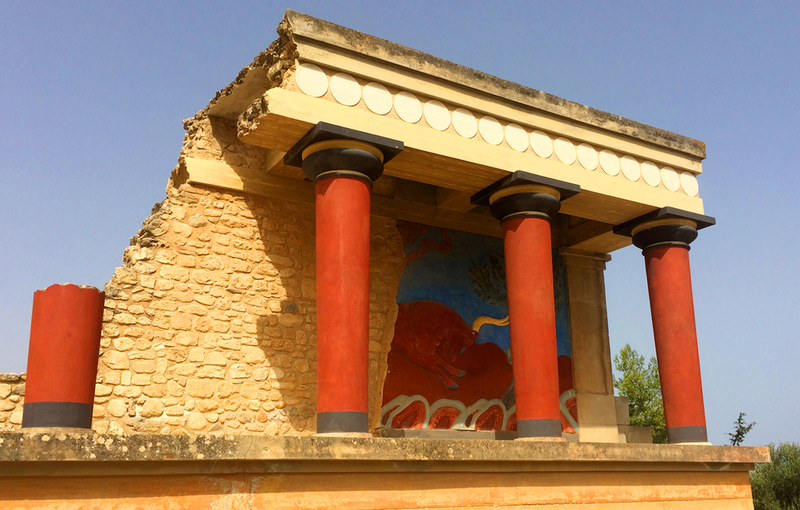 If you follow the prescribed walking path, one of the last sites you’ll come to is perhaps the most famous – the north entrance with its brightly-colored red columns and (fittingly) bold bull fresco.